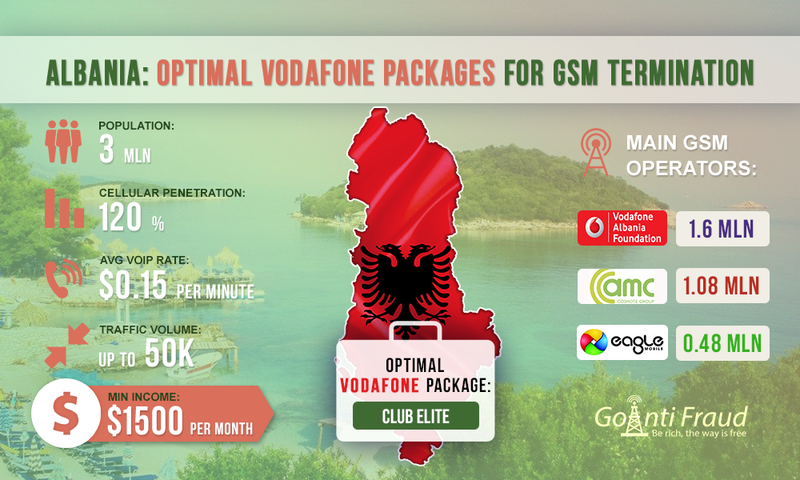 Vodafone is the first and largest GSM operator in Albania. Its subscriber base accounts for more than 1.6 million people, with GSM covering 90% of the territory. Therefore, many terminators choose this operator when they decide to connect VoIP in Albania. When connecting to all three tariff plans, the operator provides a sufficient number of minutes to make calls and send SMS. GSM termination via Vodafone SIM-cards is very profitable. GoAntiFraud offers great opportunities for GoIP equipment users by EjoinTech & ChinaSkyline, Topex who do GSM termination. We provide efficient tools for the protection of SIM-cards from AntiFraud systems so your business will make more profits. You can take advantage of our offers NewBusiness for beginners and Corporate Solution for GSM termination professionals. Club Elite is the optimal package to connect. It provides active communication and numerous calls. According to the terminators, using this package, you can terminate traffic up to 8 days before the card is blocked. The subscriber gets 3,000 minutes to make calls and the same number of SMS. You can connect to this tariff plan for as little as $15.65. A minute of conversation, with an average load of equipment, will cost $0.0053. When you connect to the Club Extra tariff plan, the operator provides 2,500 minutes to make calls and send SMS for as little as $12.52. One minute of conversation will cost about $0.051. Another alternative package for termination is Club Superior. When you connect to it, you get 2,000 minutes to make calls and the same amount of SMS messages for $9.39. In this case, a minute of conversation will cost $0.047. With the average national rate being $0.15. The terminator's profit when connecting these packages will range from $0.099 to $0.145 per minute. And the income per month will vary from $1,000 to $1,500 via one channel. When connecting multichannel equipment, this amount is multiplied by the number of ports. If you install a GoIP 16 gateway, on average, you can make about 20 thousand dollars.